András Pető was at loggerheads with much of the Hungarian medical establishment of his time. The professional community despised him. They were circulating rumours that he didn't have a medical degree, that he was a quack. They were constantly trying to dump him. Well, he was an eccentric. He wasn't a conformist. They said he was a charlatan who treated patients with strange instructions, methods and medication! He himself was to blame for the fact doctors and other professionals believed it to be some kind of personal magnetism or suggestion. Look, they bring a person in here, he can't move. They roll him in here, then I meditate. I look for the therapeutic movements that he needs, then we'll do those. – How are you healing? I can't say 'I'm meditating', they'll regard me as a cretin and they'll take the children off me', and so on and so on. So he couldn't say this but he had to say something, and meditating wasn't a good enough explanation. By 1953 he was boldly asserting the overarching, explicitly stated theoretical statement of his career, that his conductive motor therapy was in fact a special pedagogy. The Ministry of Health did not like András Pető and more than once tried to close down his Institute. Gábor Palotás, who also belonged to his circle of friends, came in out of breath. – The Professor has been put into retirement. – That's no problem, said the Professor, the problem is that the paper boy is still a long way down the street. – Pető here. I have been put into retirement, yet again. The Ministry rescinded its intent to retire him a week later and apologised to Pető. They didn't like Pető, they would have done anything they could to close the Institute. He wanted to be out from under their control and their persistent opposition. They rejected him. Correspondingly, he rejected them. Pető kept assuring that he could not justify curing as was expected, so he would go over to the Ministry of Culture and provide education, and then he might be allowed to work in peace. He finally pulled this off. Therefore the original name – Movement Therapy Institute – was changed to Movement Education and Teacher Training Institute. – This gambit will transfer me from the Ministry of Health to the Ministry of Education. Education is allowed, since it's not a science – not in the same sense as medicine. I'll say I educate, and then they'll leave me alone. 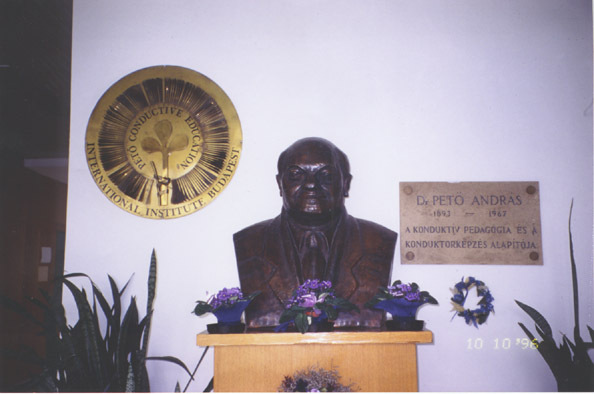 ...through the cooperation and help of many friends, including Sandor Torok, there came the great twist; Peto – and his Institute – do not treat these children, they educate and develop them. So the Institute was not a therapeutic, a medical institution, and no longer came under the Ministry of Health. You have had to face lots of difficulties on your way, and lack of understanding, but now it is clear that the large-scale introduction of our pedagogical method is inevitable. I honour your strength and persistence in pursuing your noble aims. The above selection was extracted from the Pető Quotationary to which the page numbers refer. True of false? Is this narrative a fair account of what really happened, or something more partial, part of the smokescreen that András Pető generated around himself, his ideas and his work? Is it just part of conductive pedagogy's Creation Myth, or has this tale been in itself an essential component of the continuing story, part of the glue been vital to holding the system together through all its travails? Who knows? Now in 2017, at the direction of a very different government with very different goals, PAF (the former András Pető Insittute) is to be incorporated into the Semmelweis Medical University, at the heart of Hungary's medical establishment. What will happen to this story now?